“Ian, I thought all day about what story I was going to tell you tonight and I’ve got the perfect one.” Mac tapped Ian on the shoulder. “Oh no I’m not. I’ve got a great one for tonight. Let me tell you,” Mac pleaded. “My ancestor, Gulliver Raccoon, was a great explorer. He traveled the world with Marco Polo. They went all over China and to India. When they arrived in India, Marco Polo wanted to visit some other people, so Gulliver stayed in the city. He found a huge tree and slept inside a hole in the middle of the trunk. Each day he’d wander about. He had to be careful to avoid the cows. They were everywhere. There was also plenty to eat; fruit, vegetables, bread and rice. Gulliver enjoyed his visit, until one day. An Indian man named Haramba, was out picking rice. His back hurt and he was weak from hunger. He was a very poor man who had only one ox. He lived in a dilapidated shack on the outskirts of the city. “Gulliver went exploring the woods. He’d heard about tigers and wanted to see one for himself. The woods skirted the rice paddies. He saw all sorts of people bent over taking care of the rice. Gulliver ignored them and continued his search for the tiger. He didn’t see the bag that fell over his head and scooped him up or the man who’d thrown it. Gulliver screamed and kicked and wanted out of the bag. He knew it wasn’t the tiger! “Haramba tied the bag up and carried it over his shoulder. He ignored Gulliver’s kicks and punches. When Haramba got to the river, he looked for a boat. Haramba didn’t have his own boat, so he borrowed someone else’s and dropped the bag into the boat. Haramba was happy. He could take the raccoon to the palace and sell it to the Rajah for a lot of money. The Rajah had a zoo on his palace grounds with all sorts of strange animals. Haramba had never seen a striped animal like this with patches around its eyes. 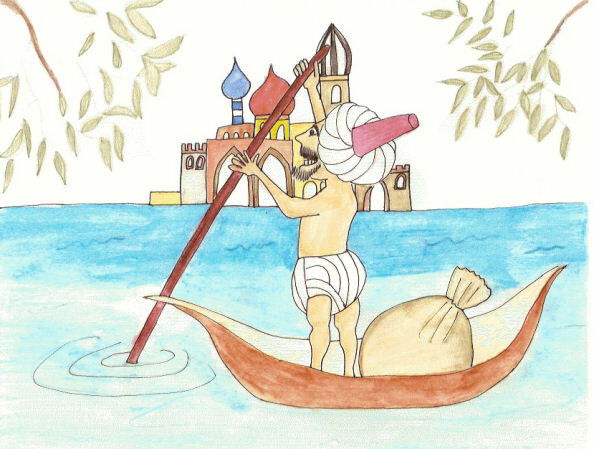 He rowed across the wide river and arrived at the royal palace. “Poor Gulliver. I wouldn’t want to be kept in a cage,” Ian said. “That was a nice story, Mac. You’ve got a lot of interesting ancestors,” Ian said. “I’m truly blessed that way, aren’t I? Well, time for bed. I’ll see you in the morning.” Mac yawned and lay down on the branch. Both Ian and Mac dreamed all night about tigers and royal palaces.